The PC control software allows the user to customize the system to meet the installation requirements. Settings can be stored in the unit or in the PC for file back up or recall. Industry-leading preconfigured presets are included for the most common masking applications. These settings are based on AtlasIED’s proprietary Chanaud Masking Filters, designed by industry-leading sound masking expert, Dr. Robert Chanaud. Two professional-grade pink or white noise generators incorporate true analog noise production. Analog is the highest-quality generator as it produces "true-random” and “non-repeating" impulses. It is the very nature of this "randomness" that generates that distinct masking noise. Automatically ramp the masking noise up or down via time schedule. Throughout the day or hour, it will dynamically raise and lower the noise level to match a facility’s busy or non-busy times. 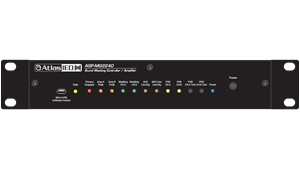 The ASP-MG2240 incorporates professional-grade digital signal processing. 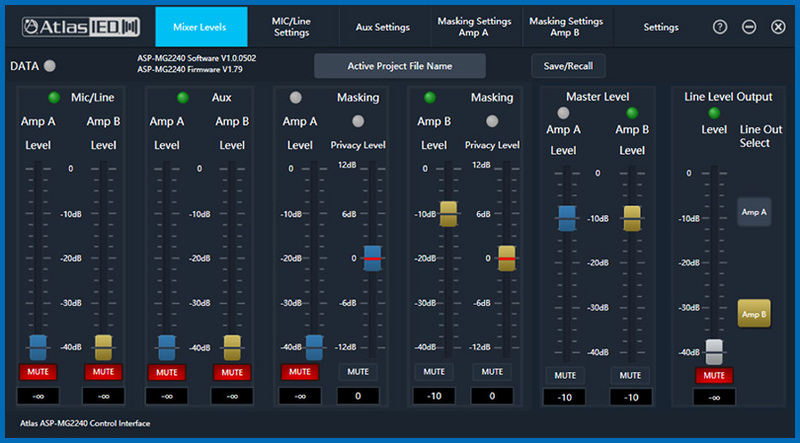 Each masking output includes a separate 1/3 octave equalizer for system fine tuning. Adjustable output limiters are in the audio chain to protect against system overdrive. The ASP-MG2240 is an all-in-one solution for most environments. 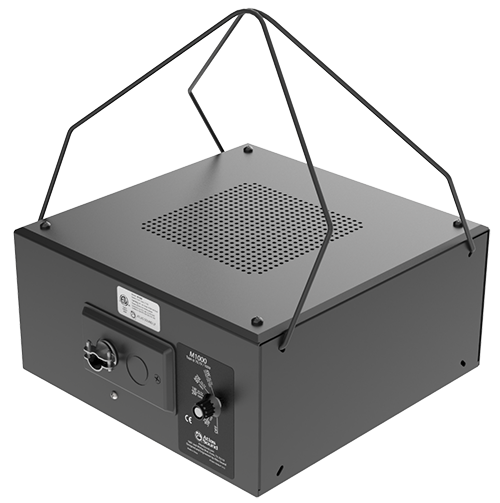 It not only supplies speech privacy but also delivers paging and background music audio. Mic / line and AUX inputs each have a selectable five band EQ and Hi & Lo pass filters. 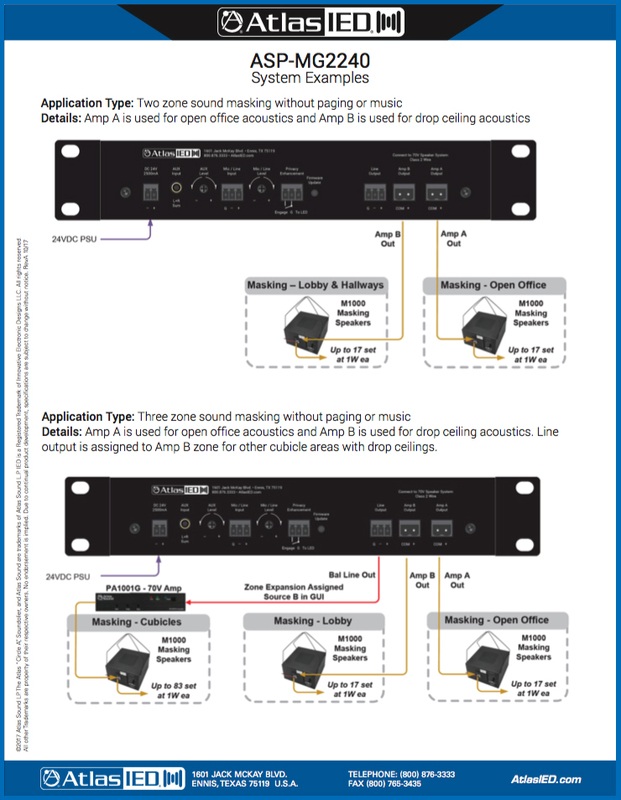 For paging applications, the ASP-MG2240 incorporates a unique hi Q feedback filter specifically tailored to the vocal frequency range. The unit features two internal 20-watt amplifier channels that are more than 90% efficient when combined with the time scheduler. When the scheduler is set to minimum use, the ASP-MG2240 only draws 4.4-watts, during everyday use the average power consumption is only 19-watts, and under maximum use power consumption is 67-watts. Give your customers energy savings with the most energy efficient sound masking systems available today. A balanced line output is also included to create a 3rd zone. 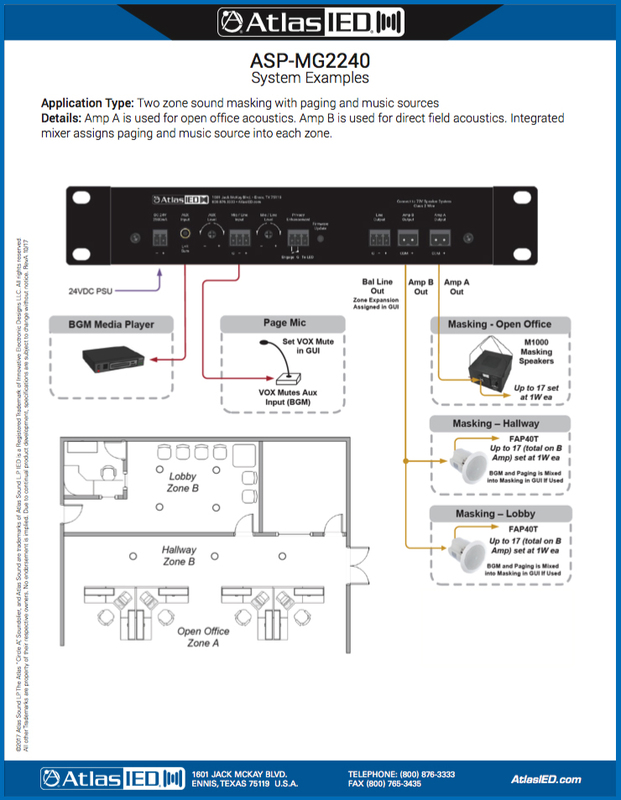 The ASP-MG2240 not only supplies speech privacy but also delivers paging and background music audio. Mic / line and AUX inputs each have a selectable five band EQ and Hi & Lo pass filters. 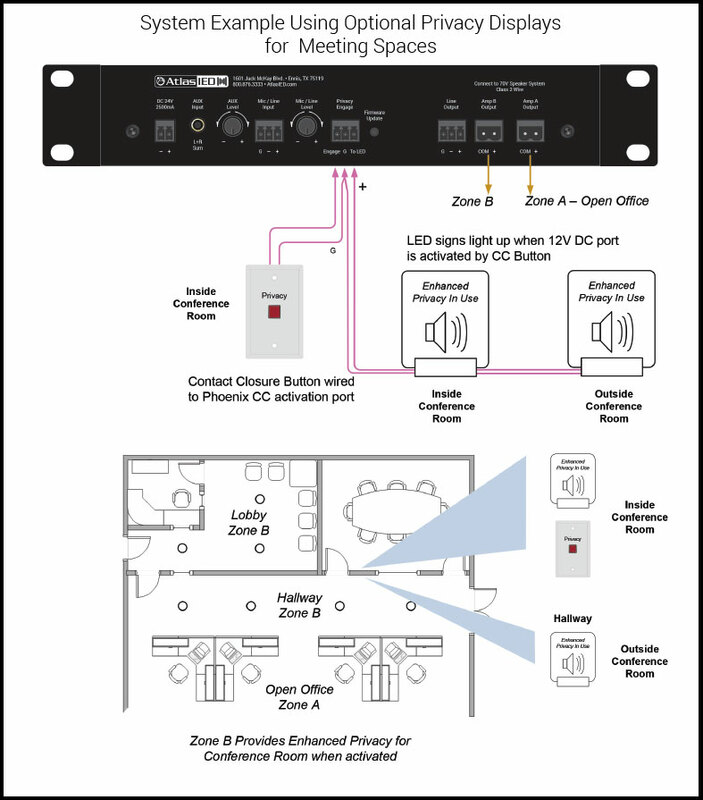 Add an AtlasIED ZCM-V2+, and you can integrate VoIP phone paging to your system's capabilities, creating a paging, music, and masking system that meets all your office space needs in one simple and cost-effective solution. Adjustable output limiters are in the audio chain to protect against system overdrive. Easily catch incorrectly installed speakers or wiring shorts. The ASP-MG2240 includes a patent pending automatic diagnostic system test, called the Push Here Diagnostic (PHD). The PHD button is designed to check the connected speaker lines for wiring and amplifier loading errors. Once all speakers are connected, the circuit automatically verifies that the attached speakers' tap settings do not exceed the amplifier's rated power and the speaker wire is free from shorts. 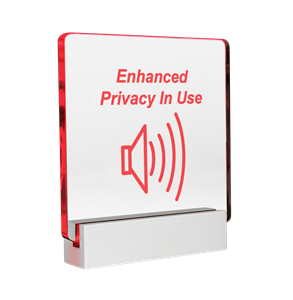 Designed for meeting rooms, medical, and law offices desiring speech privacy, a switch can be pressed to activate the "Speech Privacy Enhancement" mode. Once the button is pressed, the masking signal level will ramp up to a pre-set level to enhance privacy. With a second press of the button, it will ramp back down to normal sound levels. 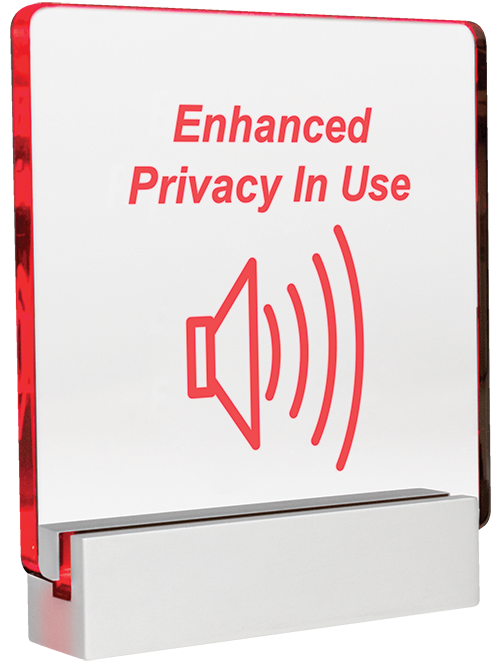 The LED privacy sign (Model # ASP-MG2240S) is an optional accessory. 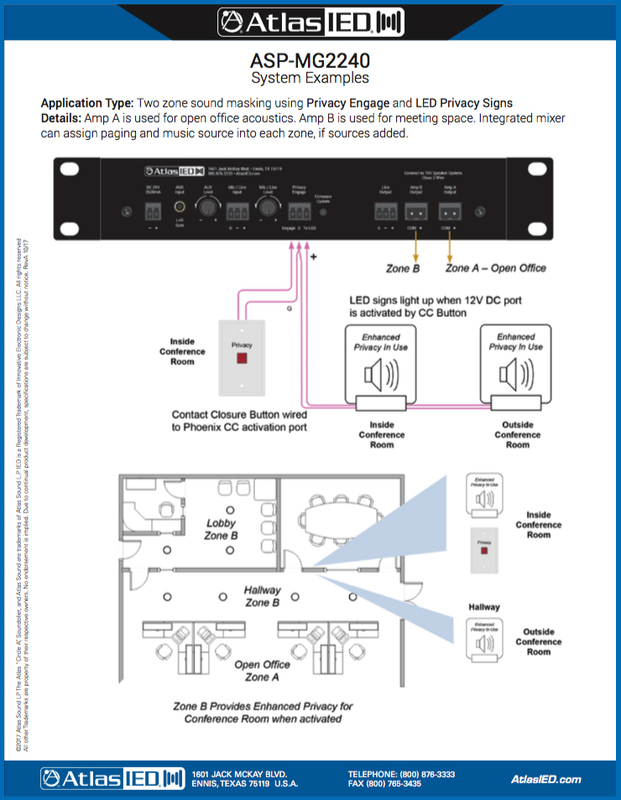 It provides a visual indication that a room is occupied and the privacy engage feature is being used. Easily mounts to wall and/or ceiling including a single-gang wall box. With our 1 million sold, the M1000 is the perfect speaker solution to complete your system. You can connect up to 20 qty M1000's per each output at 1W tap setting. The exclusive EZ hang brackets simplify installation. This innovative suspension system utilizes two collapsible galvanized hang- ers configured to allow quick upward, downward, or horizontal firing installation. The hangers are factory-installed on the unit and fold flat for shipping. To meet most local code requirement, the M1000 includes an innovative cover containing both knockouts and a strain relief. This system will allow the use of rigid or flexible conduit (if required) and easily accommodates “through” connections on the removable plate. To fit continually shrinking construction budgets, the M1000 is very aggressively priced. Contact your regional Atlas Sound representative for details.